More from the Great Tastes Show in Baltimore. Yup, that is me with the very tall and handsome, lawyer turned baker, Warren Brown. You've seen him on his Food Network show, Sugar Rush, and now we will see more of him as he officially opened his Baltimore bakery, Cake Love, at the Can Company in Canton yesterday. We had some down time before his demo and we chatted. 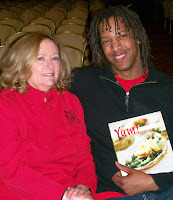 He has a cookbook coming out in April which was a great segue to show off my cookbook YUM! 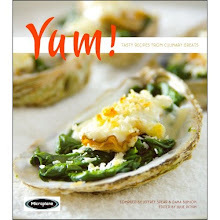 Tasty Recipes from Culinary Greats co-compiled with Jeff Spear. 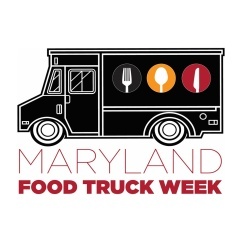 I just happened to have a copy with me for the Baltimore Food Blogger panel later day. He couldn't believe that Jeff and I did the entire book in 4 months. So to you Warren, here is the official greeting: Welcome to Bawlmer HON!